Collinsville was driving for a potential tying score (trailing 7-14) having reached Oologah's 41 yard line with 1:56 left in the 2nd quarter when an interception and a problem covering a kickoff allowed two additional Oologah touchdowns before halftime. The Cardinals reversed that trend in final 4 minutes of the game scoring two touchdowns of their own but the damage was already done as the Cardinals slip to 3-3 after a 3-0 start. Collinsville appeared ready to counter back as Kevin Phillips reached the Oologah 41 with 1:56 left in the 1st half on a Chronister pass from the Cardinal 44. Unfortunately Chronister's next pass was intercepted at the 33 and the momentum shifted with Oologah scoring 2 more touchdowns before half and a 7-29 midway score. Oologah had kicked off to Collinsville with 41.6 seconds left in the half but the Cardinals failed to cover the ball at their own 29. 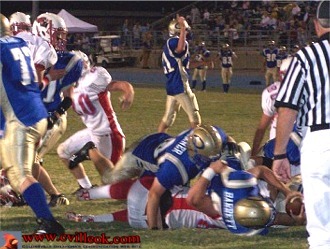 Oologah scored in 5 plays (including a spiked pass to stop the clock). Tyler Nair (#46) took the kickoff following Oologah first touchdown from about the 25 out near the 40 but fumbled when hit and Oologah had the ball at the Cardinal 42 to begin their 2nd possession. Oologah took the game's opening possession and drove from their own 26 to the Collinsville end zone with 8 running plays. The 2 yard TD run above came at 9:08 in the 1st quarter. The Collinsville defense allowed Oologah less than 10 yards on their 2nd possession including this pressure by David Chester (#82) and Chance Riley (#80) for an incomplete pass (above). Riley sacked the Oologah QB on the next play (a 4th &12) and Collinsville finally started their first offensive series (below) at their own 34 with 6:32 left in the 1st quarter. I almost got a photo ... and the Cardinals almost got a TD on this 4th & 4th Chronister pass to David Chester (from the 12) at the goal line but the ball was knocked free ending Collinsville's 1st offensive drive at 2:14 in the 1st quarter. 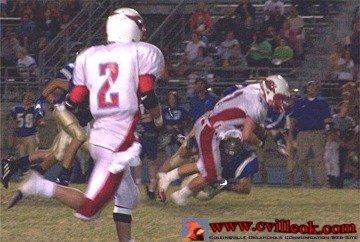 Collinsville moved the ball from their 34 down to Oologah's 12 before the drive stalled (4th down attempt at right). 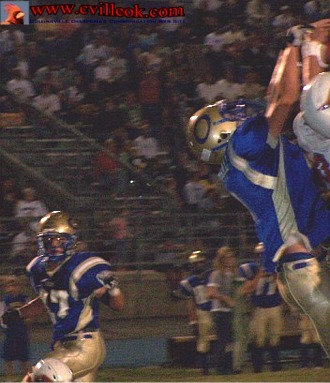 Collinsville held Oologah again on their 3rd possession which ended early in the 2nd quarter with a partially blocked punt and the Cards starting at Oologah's 33. Jared Billups carried down to the 18, Garrett Thurman carried to the 16, Tyler Tolleson (#40 above) carried to the 10 yard line setting up the TD below. 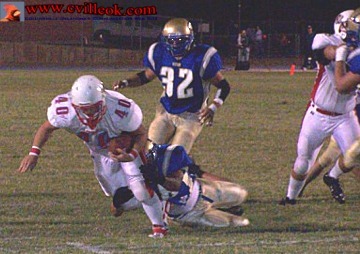 Kevin Phillips (#11) carried the final 10 yards for Collinsville's first touchdown at 10:07 in the 2nd quarter. 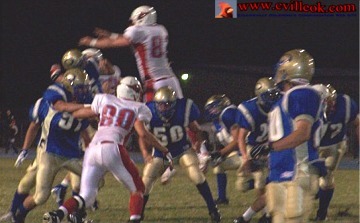 Chronister's extra point kick tied the score at 7 all. Oologah scored again on their next possession at 4:45 in the 2nd quarter to go back up 7-14.